ALGAE CONTROL: "Ewww...Algae!" There’s a good chance your pond will experience an algae bloom. Whether it’s string algae or single-cell algae, it grows fast and can quickly “choke-out” your entire pond. Heavy algae is not only unsightly, but it can stress your koi and even affect their breathing. It’s important to keep your pond properly balanced to avoid pond algae blooms. SDPS can control your algae problems. 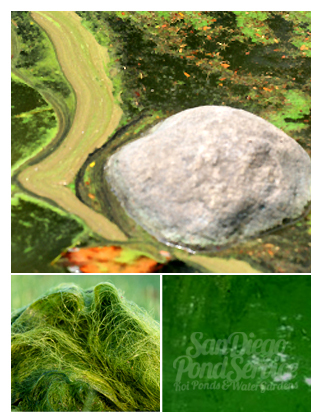 String algae thrives in waterfalls, streams, and shallow areas of your pond. Combined with warmer temps and direct sunlight, there is a constant supply of nutrients in these areas. Water temperature changes play a big role in algae growth. When your pond is experiencing drastic temperature swings, there is a good chance an algae bloom may occur. New ponds, or ponds without an established filter system, often experience single-cell algae blooms. This "pea-soup" algae out-break can be controled with our help. San Diego Pond Service's staff know the "ins" and "outs" of pond water chemistry. 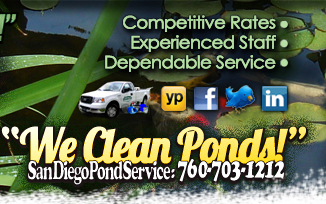 Without an UV Sterilizer, or chemical treatments, or our help, it may take months for your pond to rebalance itself. STRING ALGAE: Long, thin, sticky, stringy, green, hair-like algae that grows rapidly in ponds experiencing drastic termperature changes. String algae typically requires a chemical treatment followed by a pond vacuuming for complete removal. SINGLE-CELL ALGAE: Green water or “Pea Soup” colored water. Murky green pond water with virtually zero visibility. Single-cell algae requires heavy bacterial chemical treatments.